As many of you may know, 2018 marks it as Brownstone’s 20th anniversary! Along with this also comes Kim and Chef Glen’s 20th anniversary, as they continue to cook and love together. 20 years ago, Kim and her brother started the Brownstone Cafe after finding the perfect location in the Villa del Sol. After opening, they hired a chef, unknowing of what would soon happen. This chef and Kim would later fall in love within the first month of hiring him. Five months later, Kim and Glen would be married in this very courtyard. As the business continued, Kim’s brother would also get married and move on to other projects and passions. Kim and Glen remained, and continued to run the restaurant together. This year marks the 20th anniversary of this legendary story which tell the beginnings of the business and a family! Kim and Glen would also like to thank you, the customers, for being so great and supporting us for the past 20 years! There will be more to come soon to show our gratitude! Don’t forget to visit the Brownstone Cafe and celebrate with us! Prom Project at the Brownstone! 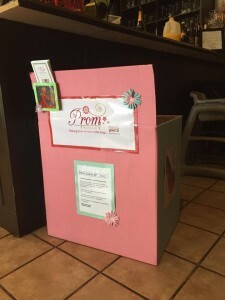 Check out our lovely Prom Project donation box! Drop off your retired prom dresses, shoes, makeup, and accessories at the Brownstone Cafe and make some prom dreams come true! Planning an event with Brownstone Catering and looking for an event venue? Look into the Assistance Leauge of Fullerton’s Chapter House! Very reasonable pricing, large enough for 125 guests, and elegant setting. Great for a wedding reception, birthday party, or business meeting!